Michelle Carter (left) is accused of telling Conrad Roy to “get back in the truck” when he got out. NEW BEDFORD — Authorities have accused a Plainville teenager of coldly urging a friend to kill himself last summer, claiming she helped him research how to die from carbon monoxide poisoning and told him to “get back in” his truck when he had second thoughts. 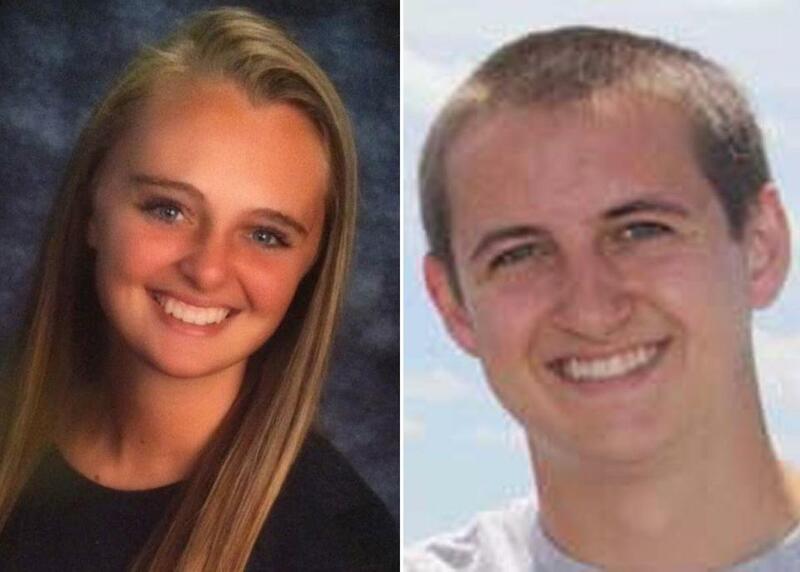 Prosecutors have charged Michelle Carter, 18, with involuntary manslaughter in the death of Conrad Roy III, an 18-year-old from Mattapoisett who committed suicide in a parking lot in July. Carter’s lawyer denies the accusation. Police, who searched Carter and Roy’s phones in the investigation, say she was in close contact with Roy in the days and hours before his death, even as she texted friends to say he was missing and that she was worried for his safety. After writing one friend to say, “I’m losing all hope that he’s even alive,” Carter texted Roy, “Let me know when you’re gonna do it,” according to a police report. Carter, now a senior at King Philip High School, had a “full understanding” of the suicide plan, and in the days leading up to Roy’s death “not only encouraged Conrad to take his own life, she questioned him repeatedly as to when and why he hadn’t done it yet,” the report said. Carter’s lawyer, Joe Cataldo, said the charges were a massive overreach, and that Carter was shocked by the accusation. Cataldo said prosecutors were misusing the state's manslaughter law to punish her for “not preventing a voluntary decision,” and predicted Carter would be cleared of the charges. Conrad Roy, Roy’s grandfather, said Friday that he strongly believes Carter was responsible for his son’s death. He said it was clear his grandson was having second thoughts about ending his life, and would be alive today if Carter hadn’t convinced him. While the alleged behavior seems almost implausibly heartless, authorities said the phone records showed Carter as seemingly desperate for attention and sympathy, and eager to be seen as a tragic figure, authorities said. Even before Roy died, they said, she was already reaching out to friends expressing guilt that she hadn’t done enough to save him. Conrad Roy III had graduated from Old Rochester Regional High School in June with a 3.8 grade-point average, and earned his captain’s license from Northeast Maritime Institute, according to his obituary. He was a well-rounded athlete, and had been accepted to Fitchburg State University. Carter was indicted Feb. 5 and arraigned the next day in New Bedford Juvenile Court because she was 17 at the time of Roy’s suicide. She was released on $2,500 bail, and was ordered not to have any access to social media or text anyone outside her immediate family. She has pleaded not guilty. She is due back in court in April. The charges came to light this week after reports in The Standard-Times of New Bedford and The Sun Chronicle in Attleboro. “Instead of attempting to assist him or notify his family or school officials, Ms. Carter is alleged to have strongly influenced his decision to take his own life, encouraged him to commit suicide, and guided him in his engagement of activities which led to his death,” the office said in a statement. Thomas Quinn, the Bristol district attorney, recused himself from the investigation because of a familial relationship with Roy’s family. Cataldo, the lawyer for the accused teen, asserted that the relationship potentially influenced the case. “It would seem to me that his whole office should be recused,” he said. Court records indicate that Roy suffered from depression and had tried to kill himself before. When Roy’s mother contacted police July 13 to report him missing, she said he had seemed despondent. Just hours later, police found Roy inside his car behind a K-Mart in Fairhaven, dead from carbon monoxide poisoning. When investigators looked at Roy’s phone, they saw that all of his text message threads were deleted, except one with Carter that stretched back a week. Through the entire sequence, Carter pushed him to end his life, police said. Roy’s father, Conrad Roy Jr., told authorities his son had met Carter a few years ago in Florida, where both were visiting family. In interviews with police, Roy’s mother, Lynn, said her son was friendly with Carter, but believed that most of their relationship was based on texts and phone conversations. Carter had attended Roy’s wake and funeral, she told police. Friends of Carter told police she was prone to exaggeration, and had a history of crying wolf. It was hard to tell if she was being completely truthful in her messages, they said. Authorities did not include most of Roy’s text messages in their report. In a text sent to a friend two months after his death, Carter said Roy had gotten out of the truck because he was scared, but she told him to get back in. Police also found a message Carter sent to a friend about the investigation just over a week after the suicide, expressing fear that she might be in trouble.